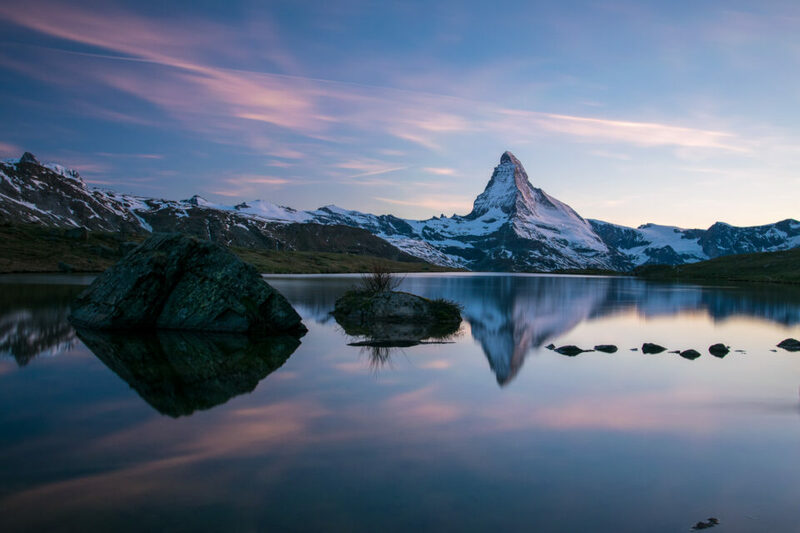 In this article, I will try to give you a few tips on how to photograph the Matterhorn in Zermatt, Switzerland. 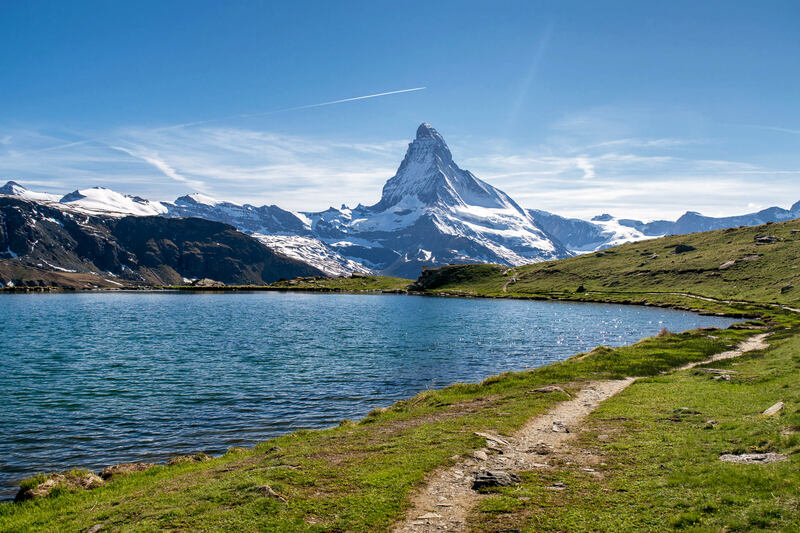 Moreover, I will also add a few pieces of advice on how to plan a trip to Zermatt. 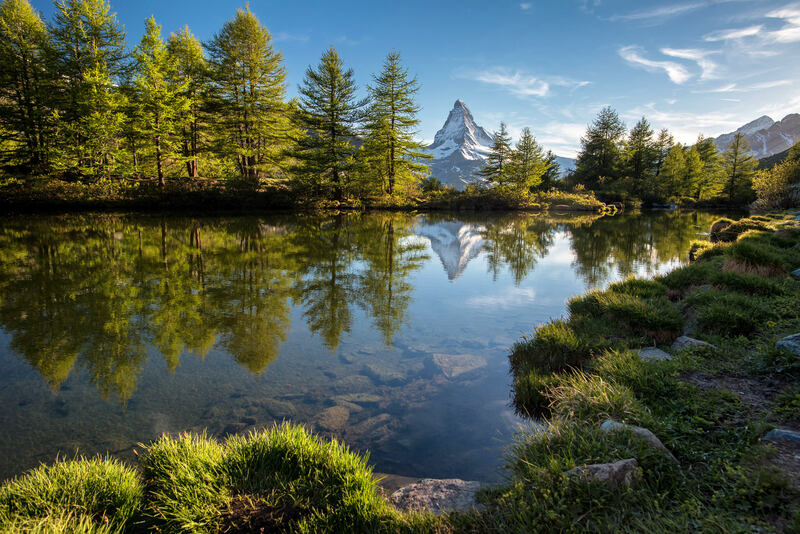 Matterhorn, located in south Switzerland on the border with Italy, is one of the most famous European Alps peaks. It towers to 4,478 meters above the sea level and is marked by its sharp pyramid shape. Its pronounced shape has always attracted many tourists and photographers. 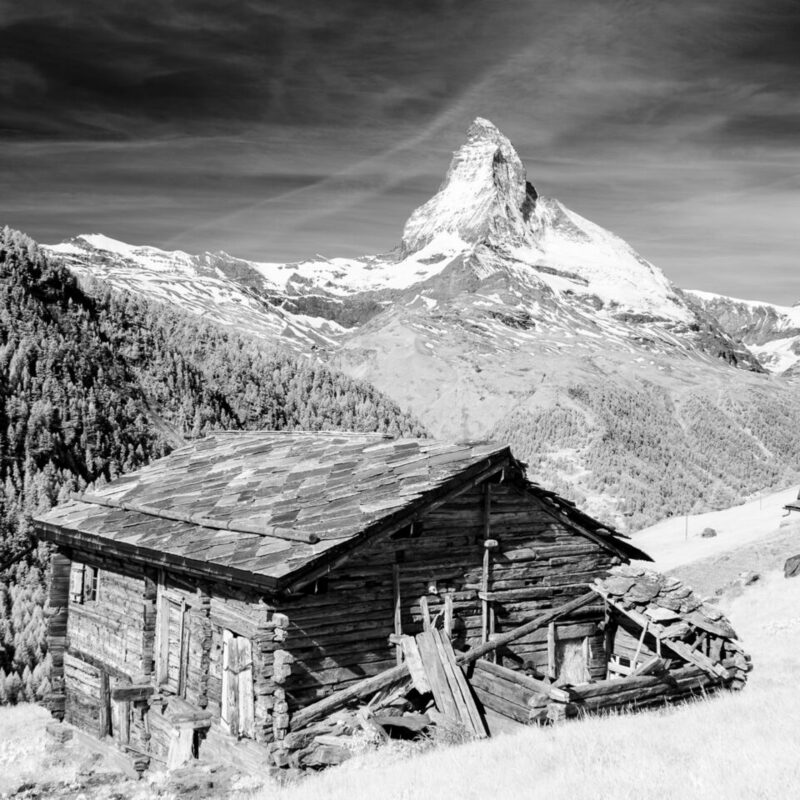 How shall you plan your trip to Zermatt and where to go to get nice Matterhorn photographs and not leave with your wallet ruined? I will focus on the Swiss side of this mountain, as it is from here (north-east side) where the most beautiful viewpoints are. Matterhorn can be climbed from the south Italian side, but there are no vista points where the emblematic pyramid shape of this mountain would be clearly discernible. 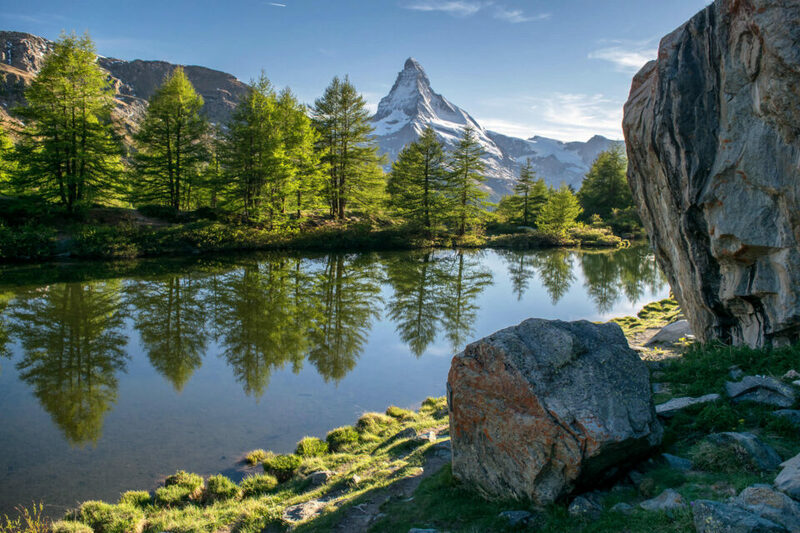 The beauty of Matterhon is also a bit of a curse, since Matterhorn and the nearest Swiss Alp-resort Zermatt has become one of the most visited places in Europe. The place is full of tourists and lately it has been especially swarming with Japanese and Chinese tourists. To put it bluntly, Zermatt is expensive as hell. So if you come as a low-budget photographer, you will immediately notice that the average tourist here is a pretty well-off person who can easily afford to travel to such destination. You can still plan a relatively low-budget trip to some of the best locations, if you are willing to backpack and sleep in a tent or walk during the early night hours with a headlamp. This has two advantages: you will not only be at the right (i.e. photogenic) places, you will also be there at the right time – around sunset and sunrise. You will avoid crowds no matter how busy the season is, and most importantly, you will not have to book the very expensive Zermatt hotels. The first thing to pay attention to, is that Zermatt is a completely car-less city. To access this location, you must leave your car in Täsch, the closest village down the valley. At Täsch, there are huge garage parking places available (for a fee) and you can take a regularly (every 20 minutes) pending train (for a fee again) to Zermatt. Or you come by train all the way from some other Swiss city (beware, trains in Switzerland are expensive, however the rides tend to be very pangrammatic). 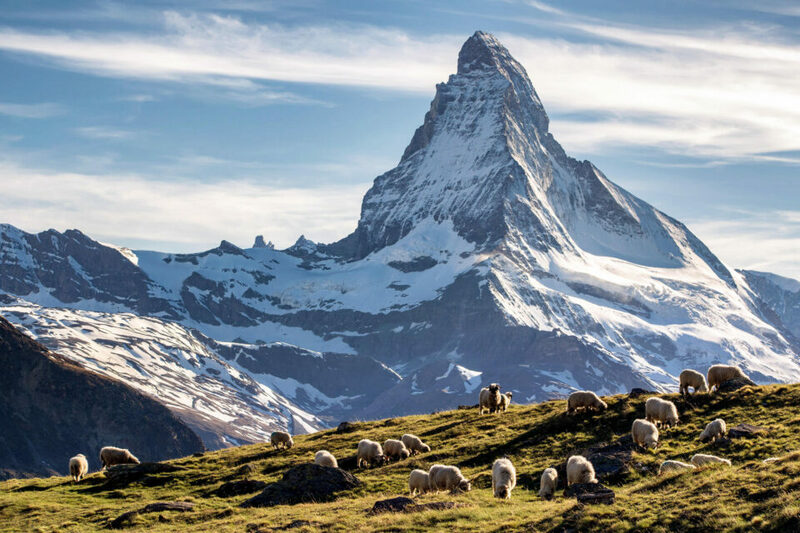 Where to Go in Zermatt? 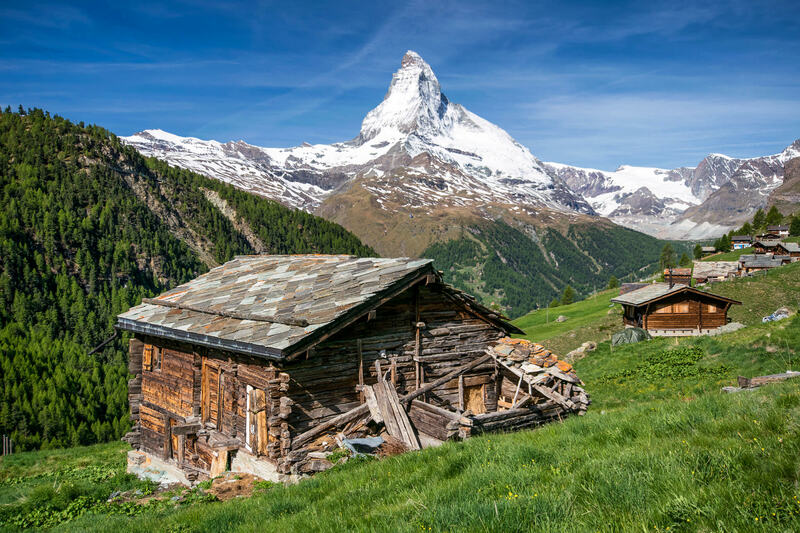 Zermatt is an Alpine village with many wooden houses overlooked by the majestic mountain in the background. 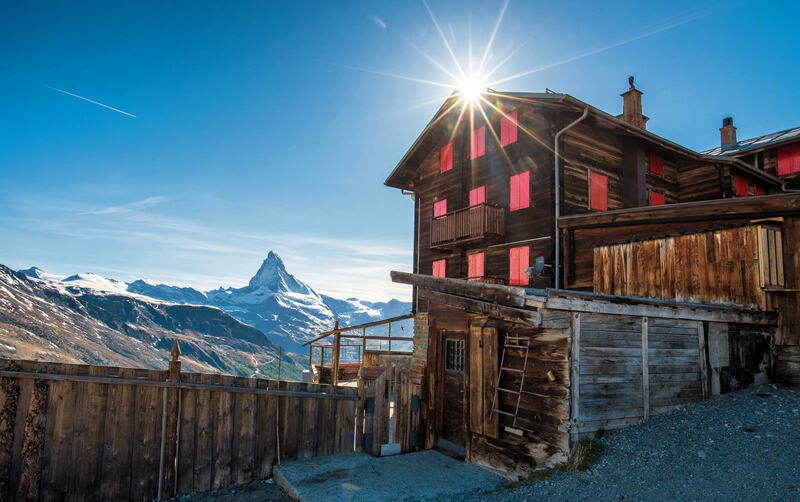 The fact that Matterhorn can be seen only after reaching Zermatt gives this place something extraordinary. Apart from that, these are the same small places with tiny shops and restaurants, a church and a posh shopping street with all the luxury brands. For some, Zermatt may have its charms, but for me as a lover of unpopulated mountains, there was nothing to do there, so I had to leave this place as quickly as possible. Where to Go in the Mountains? If I were to recommend only one location, I would go for the 5-Seenweg (the 5-Lakes Trail) and specifically for Stellisee. 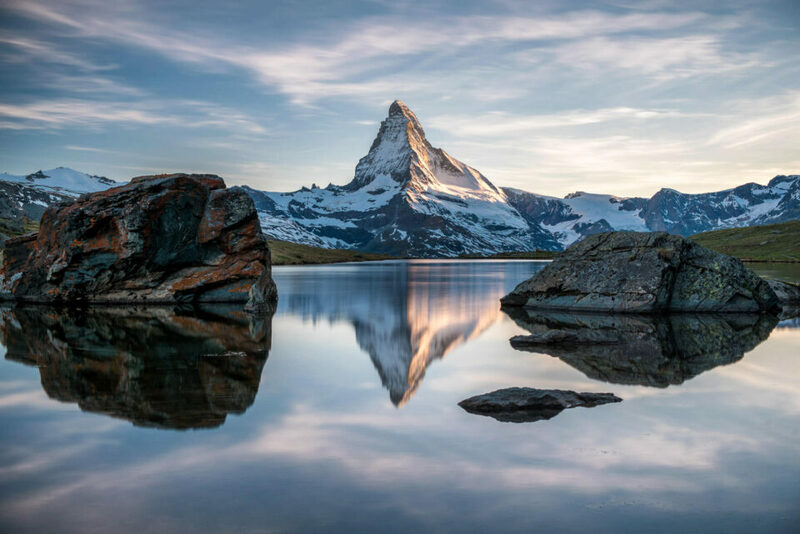 Stellisee is a mountain view that offers perfect mirror reflections of the Matterhorn peak located some 15 km (air distance) southwest. Except for afternoon times around 3-6 PM in Summer, the sun is in a very favorable position for good photographs throughout the day. This location is perfect for both sunrises and sunsets. 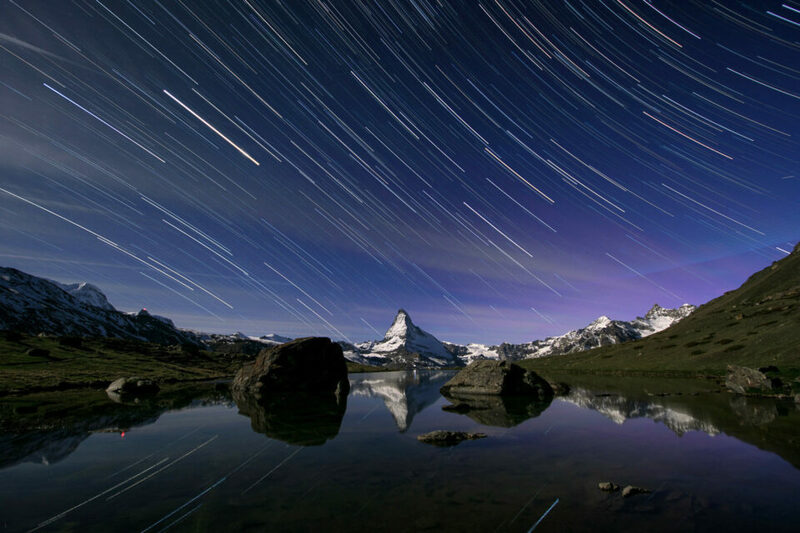 In late summer and early autumn, the Milky Way will be visible from here right around the peak of Matterhorn. In late autumn and winter, the sun will be setting near or behind. What is more, Stellisee has some lake banks with huge boulders at very convenient positions. You can find quite a few different composition options here. One option is to walk all the way up, following some marked trails from Zermatt. While you will enjoy some very photogenic spots and vistas on the way, Matterhorn most of the time will be behind your back, so I actually recommend taking this route on the way back. On the way up, the most convenient and fastest way to get up is taking the Sunnegga-bahn funicular. The Sunnegga-Rothorn valley station lies about 10 minutes’ walk from Zermatt railway station. The tunnel-train will take you up to the upper funicular station Sunnegga. Here, at the altitude of 2,280 meters above the sea level, you can either start hiking the 5 Lakes trail, which at first climbs up some 250 height meters along the ski lift and get to Stellisee after roughly 90 minutes of a nice walk, or you can actually take this ski lift and get to the Unterrothorn station at the altitude of 2550m. From here, reaching Stellisee is fairly easy and takes about 30 minutes. The second lake to be admired in the 5 Lakes trail is Grinjisee. 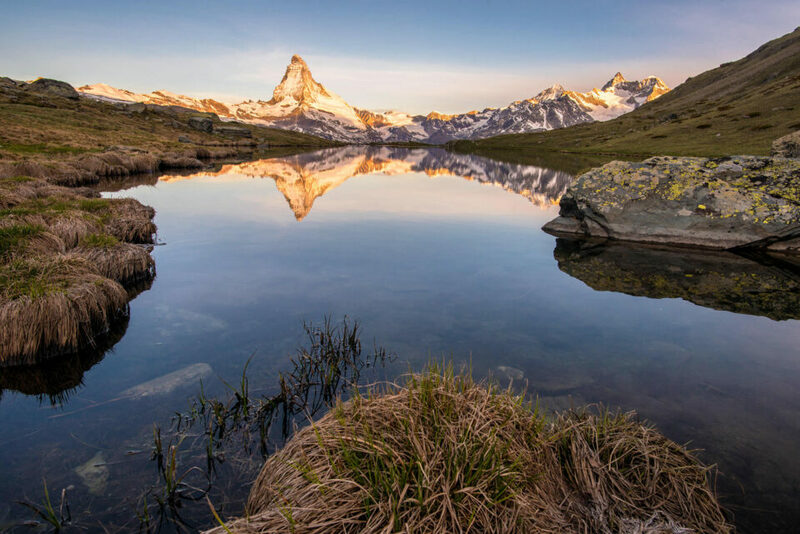 Although this lake also reflects the Matterhorn peak on its surface, the location and setting of Grinjisee is very different compared to Stellisee. It is much smaller, it is in a relatively deep valley, and its southwest shore is lined up with nice trees (larches). This is the place to be in autumn. There are some huge boulders close to the lake and behind the lake a steep slope enables making compositions from the higher perspective. The best time to shoot is roughly 1 hour after sunrise and 1,5 hours before sunset (if you want to have the foreground around the lake lit by sun). The Riffelsee lake might be more famous than the previous two, but I do not find photos from this lake more appealing. 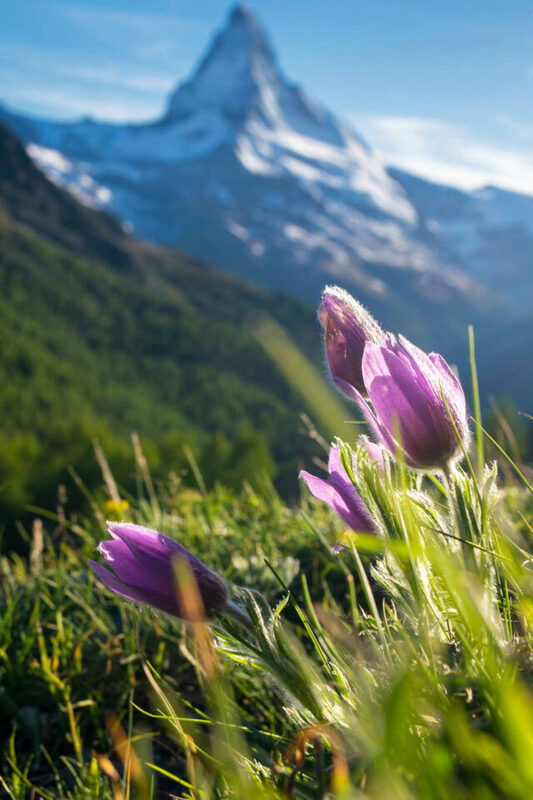 The reason why most of the photos available in different online galleries and stock databases are from here is simple: this place can be easily accessed by a famous cog railway called Gornergrat Bahn. A little nice train takes you higher and closer to the summit compared to the 5-Lake Trail. But the trails here are very crowded. When I visited Zermatt, this lake was still partly frozen and I decided to go to Stellisee and Grindjisee instead. Gornergrat Bahn is very expensive (around 100 USD one way). The good news for photographers: this train operates from early to late hours. For more information about this lake and the railway, visit this website. Ze Gassen is a tiny old-looking village on the slope near Zermatt. 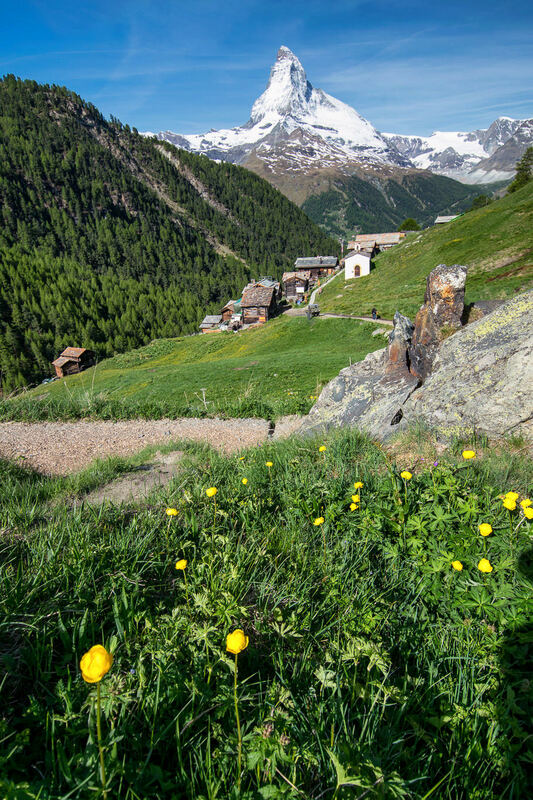 This village is passed when walking back to Zermatt from the 5 Lakes trail. Some of the wooden cottages and houses are very picturesque. Just a few hundred meters below the Ze Gassen village there is a deep valley spanned by a railway bridge. This is a good spot to wait for the train and get a shot with Matterhorn in the view. 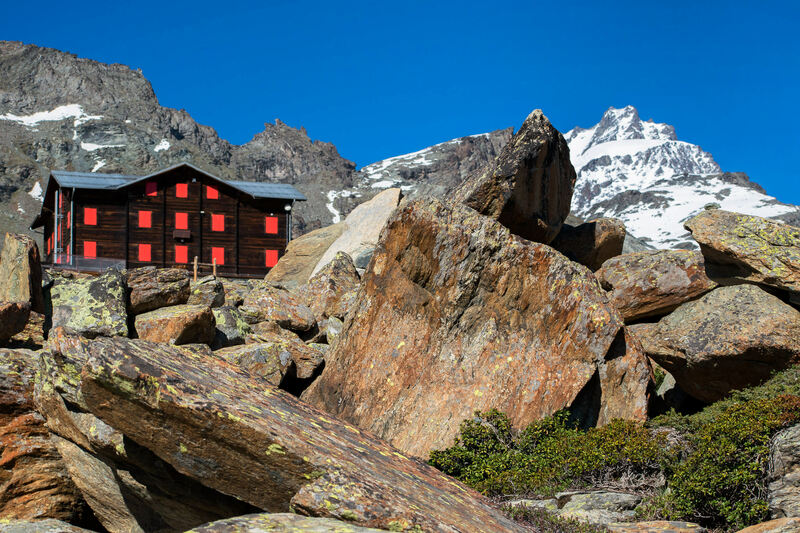 Fluhalp is a mountain hut just a few hundred meters from Stellisee (at 2,606 meters). Do not miss this place when hiking the 5-Lakes Trail – you can have a nice lunch there and get some nice composition with the hut in the foreground. 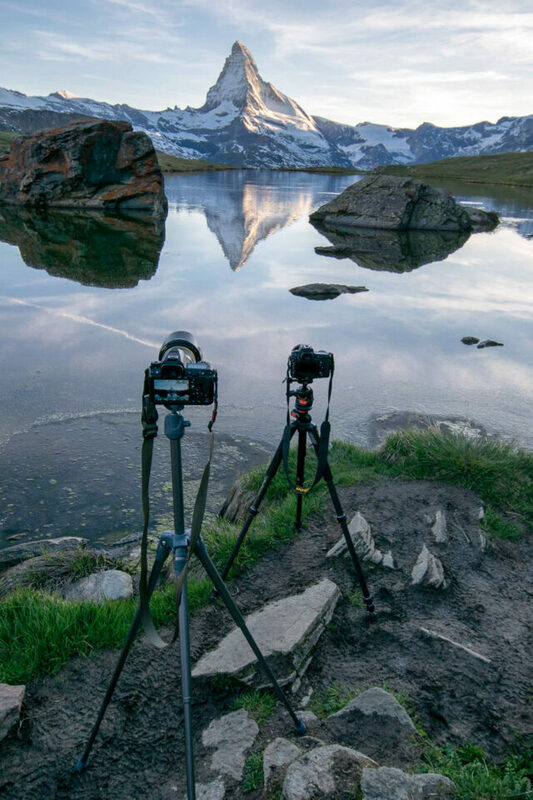 This is obviously crucial for any landscape photographer. As you could see above – all of the places I recommended are high up in the mountains. 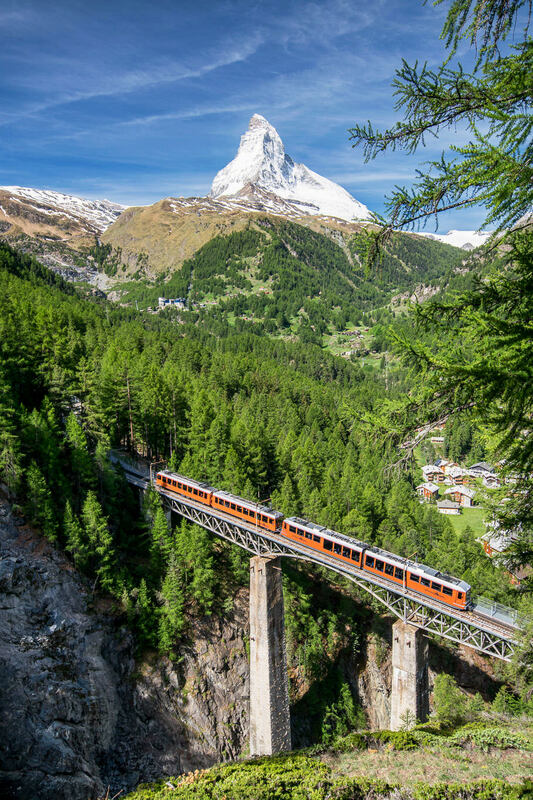 Most of them are accessible via funiculars, ski lifts or cog railway trains. But these do not operate around sunset and sunrise hours (at least not in summer). 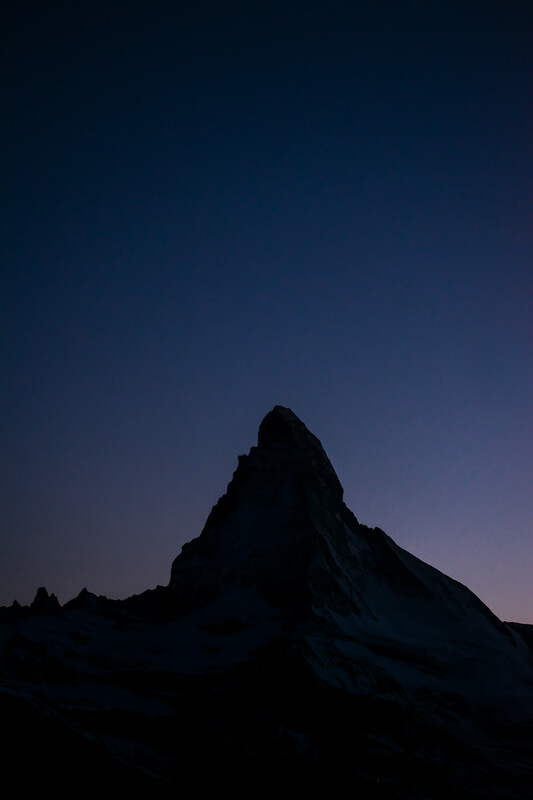 If free camping and some backpacking is not an option for you, then I would take the last cable car / lift / train (just before the closing time) and stay for sunset, walk down during the blue hour, reaching Zermatt at night with a headlamp. There are no bears and no real hazards to worry about – perhaps some summer storms and some rocks that you could stumble on. Hope you’ve enjoyed this article. 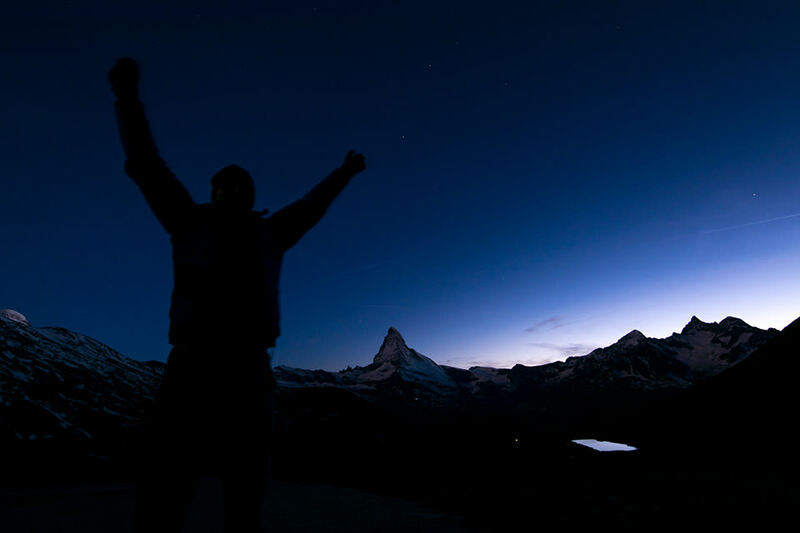 If have been to Zermatt before, please share your thoughts or perhaps even some tips below! Vaclav Bacovsky is a photographer from the Czech Republic. He loves shooting landscapes, architecture, macro and wildlife (see his 500px page). He blogs at www.krasnesvetlo.cz (in Czech language only). 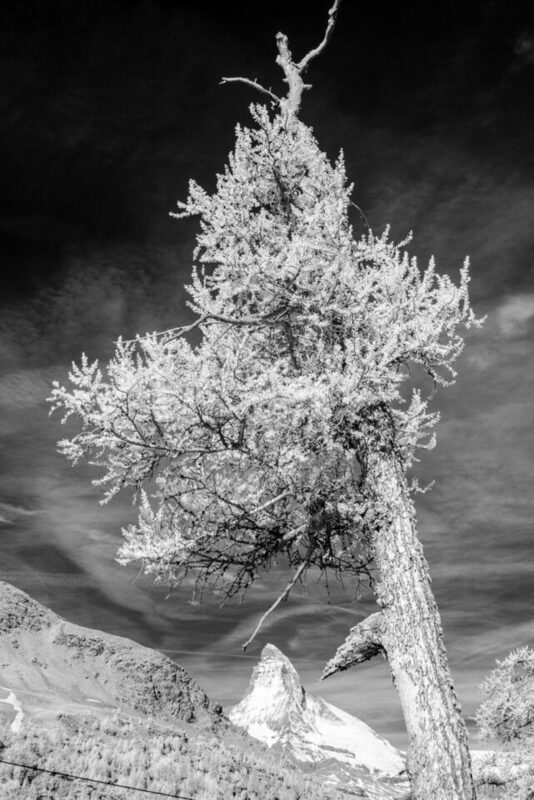 And his infrared photographs are published on his Instagram account. Great job, amazing pictures, thanks. Incredible photographs. Wow, what a beautiful place. Beautiful pictures Vaclav and very useful information to anyone visiting. Thanks, I enjoyed reading very much. Thanks for the feedback, Vinnie. V.
Like it. I have Nikon D5500. I chose it as I had a low budget. How is the camera? Hi, I do not own this particular camera, but as you can see in this article, even the older version (D5300) can produce pretty good images. Have fun with it! I have been to Zermatt/Matterhorn twice. I would like to add that the weather is one of the great factor. The first time, it was very cloudy around Matterhorn throughout our stay. The second time, a few years later, was perfect. It’s a beautiful place, perfect for hiking and photography, especially around Stellisee area. We took rides up and hiked down. Thanks for sharing your tips and pictures. Reading your article brings back fond memories. Dear Alfred, absolutely, good weather is crucial (as always in mountains) – I was quite lucky. I am also glad this article brought back some nice memories! V.
I’ve been to Zermatt twice (2002, 2004). Both times were to climb Matterhorn—and both times the weather was too wet for a safe climb—so I never was successful. (On the other hand, we were successful climbing the nearby Monte Rosa, highest peak in the Swiss Alps.) I carried minimal camera gear (Nikon FM and a 50mm prime) so I was very limited in what I could capture. Both times we stayed at hostels and these were very affordable—but you have to like dormitories, bunks beds, and sharing facilities with others. We didn’t mind. 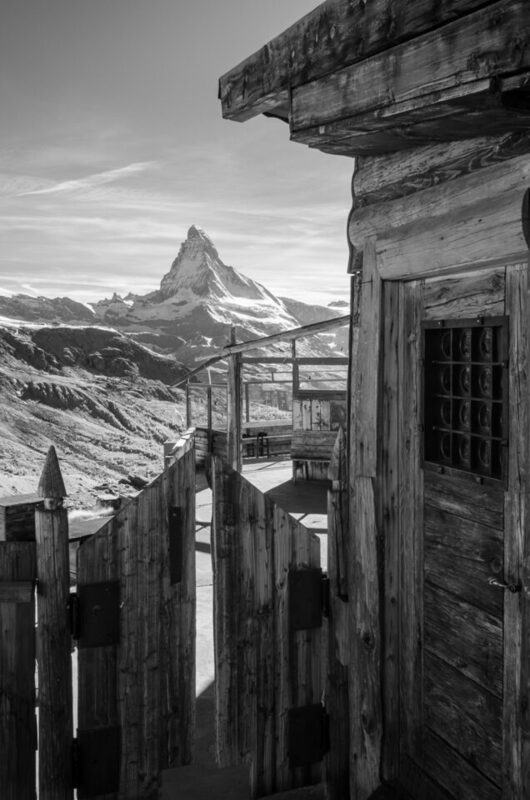 These photos brought back wonderful memories of Zermatt. Thanks. Hi David, wau, just the idea of climbing this mountain makes me sweat ;) You are right that there are some hostels, I did not check the prices of those. I guess they should be affordable. Thanks for your comment and good luck for the upcoming summits! V.
I was there 4 days ago. It was a pitty for me I just get your article today. Your pictures are excellent. And I now have one more spot on my bucket list to capture. The photos are wonderful. I have been dreaming to photo them. It is too late now that I wouldn’t be able climb the height. Thanks Sidney, I wish you could get there if the health allows, it is not too strenuous if one takes the lifts. V.
Thanks very much for the interesting article and beautiful pictures. Thanks for the tips and the beautiful photos. 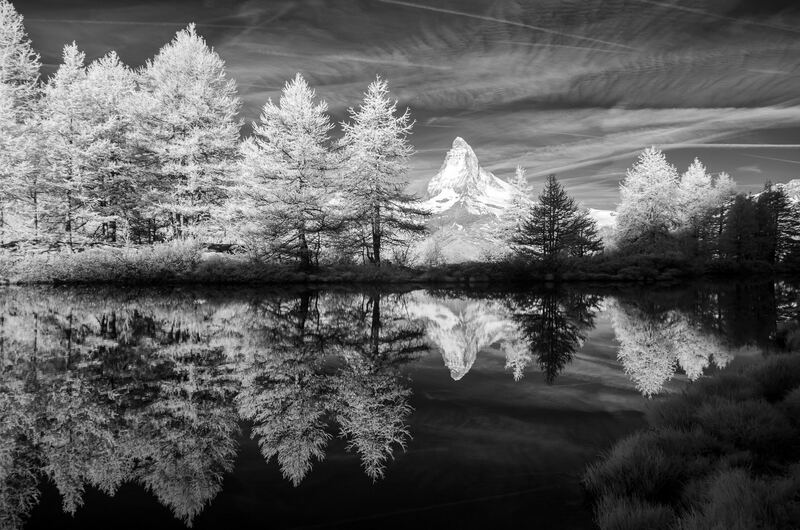 I really like some of the compositions, highlighting the beauty of the Matterhorn. Hi Mickaël, I use photographer-ephemeris website before I go to any location. But many times some composition you only plan once at the place – which was my case with the Grindjisee (I returned again to this lake in the morning knowing where exactly I shall expect the sun). Will consider writing a dedicated article on this. V.
Been going there for the past 5 years skiing, and have eaten many times at the Flualp (red window shutters). Great photos and inspiring to get out the Nikon instead of the one shot wonder I have when skiing. thanks…Flualp was closed when I was there, but I hope to return one day – perhaps in winter next time. V.
Wow Vaclav, great pictures and writing. Are there any groups of hikers or tourists that we can join? Is there a website or facebook page for that? I am going to geneva in september and we might go to interlaken from there. I think i can visit zermatt from interlaken only fot a day though. Did you visit other mountains in switzerland? Well Omar, not that I would know about any hiking groups or communities. After visiting Zermatt I spent three days around Interlaken and the mountains around are no less stunning – actually to me the peaks there (Mönch, Eiger, Jungfrau) are even more stunning, because you can get closer. I was mountain biking there and did not take so many photos (as the day was overcast) so I do not really plan to post those photos here, but visiting this area is definitely worthwhile. I also visited the area around Luzern/Vierwaldstättersee – and again, it was jaw-dropping experience – I will post images from my trip there pretty soon here. Last but not least, I visted Appenzell (Santis ridge) – and guess what, I loved it there! Switzerland is amazing. I am lucky to live nearby, I studied in Germany at the border with Switzerland, so I visited many Swiss places and cities, but the country is painfully expensive compared to my homeland (Czechia). Otherwise I would come even more regularly. Enjoy the trip! Well written and very informative; thank you Václav! First, your photos are excellent. Having family that live in CH, I have visited, hiked and skied the area. Yes, very expensive and only exceeded by St. Moritz (rhymes with glitz as the Swiss say). For future visitors, do not fail to visit the grave yard at the old church. Most of the markers are for climbers who died on the mountain. Sad, but testimony to the call of a mountain to be climbed. Many still climb this peak and die due to lack of training and equipment(ice axe & lashing all together). Desk clerks can tell some good stories about tourists who “demand the mountain to appear because they traveled so far to see it!” Clouds just don’t listen no matter how much money your have. Riding the trains to higher elevations is great fun and photo ops time. Fun place and best in summer. Dear Herb, thanks for sharing some tips with us. I had been to St. Moritz twice (unfortunately without my cameras) – so I know pretty well what that saying mean. Fantastic photographs! And some of them with a standard 18-55 kit lens, amazing! Vaclav – great pictures. Curious about time spent editing. Did you use Photoshop or LR on these? they are really nice and was wondering if they came out of the camera that way. Tks-keep up the good work. Hi Dave, day-shots (sunlit photos) are only slightly adjusted (auto exposure correction, usually some highlights down, slight clarity boost), pre-sunrise or post-sunset photos are a bit more adjusted (WB, clarity, vibrance). LR only (exctept for night shot, which was stacked in PS). I edit all my photos while travelling on my Surface Pro 3, I hardly ever spend more than 2 minutes per photo. Filtering and back-up is the most time consuming part. V.
One of the best articles I’ve read in a while and your images are breathtaking. The black and whites are so powerful! Thanks so much for the hard work you put into your art and then sharing with all of us that aspire to do the same. Very much appreciated. I should try to hike there once I have sometime. I live in Switzerland but in the opposite side of the country. Matthias, lucky you – your country is stunning. I hope to come back soon! I see some of the pictures were taken with the D750 and a 18-55mm lens. I’m curious as to why you used a DX lens on a FX body. Yes, you are right. I often use FX body + DX lens combination. I plan a whole article on this here on photographylife.com – so stay tuned. The short answer here is: I mostly use FX for portrait and astrophotography in combination with fixed primes, when I travel to mountains and carry both FX and DX body, I use DX lenses such as 18-55 VRII (or AF-P), 35mm, 70-300 AF-P with FX body with very good results. I save a lot weight with it. But note that not all DX lenses are very good at FX bodies (I am not talking about using only DX size of FX sensor, I am talking about using the whole FX sensor area in combination with DX lenses). V.
you mean that the 18 55 VRII and the 70 300 AFP DX cover the image circle of the FX sensor ? like the 35 dx for exemple but without limitation of vigneting? 18-55mm VRII covers 98% of the FX image circle from 24mm to 55mm, 70-300mm covers roughly 90% of FX circle (equally, throughout the zoom range), so some cropping is needed. Not ideal, but good enough for me. Best results are achieved by 35mm DX, as you wrote. Vignetting is pronounced with all those DX lenses, the more you close the aperture, the more vignetting. Sorry for commenting late, I haven’t seen this article earlier. I’m glad you like my home country and you’re right: it’s definitely not cheap. Alas, camping in Zermatt is prohibited outside the official camping grounds. Of course, you can ignore that and risk a fee, if you like, but I think the readers here should know that fact. If you’re lucky, you can legally camp on a private ground with the owners permission. 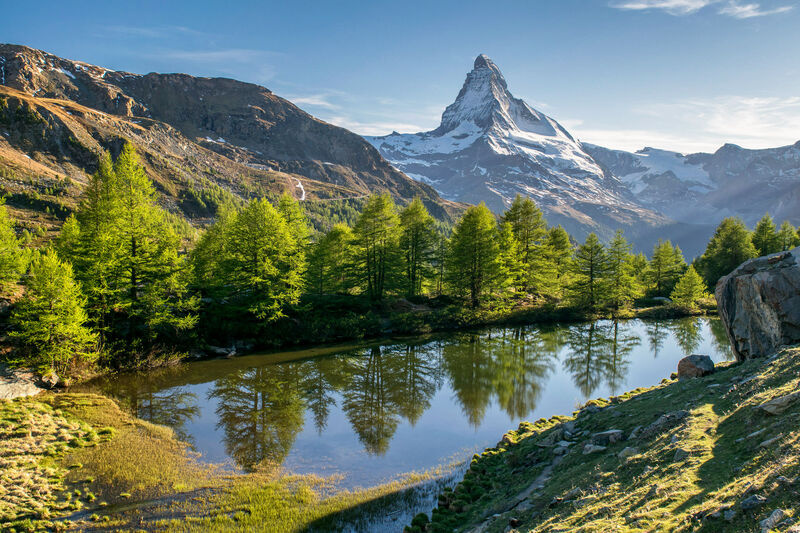 In other parts of Switzerland it is allowed to camp in the wild (under certain circumstances – usually above the tree line and outside protected areas). Hi Matt, thanks for highlighting this fact – I will update the article accordingly so that is does not lead to any problems for readers here. Awesome pictures, thanks for the tips hopefully our photos will turn out as good as yours! Thanks for your feedback, I hope so too, enjoy your trip! 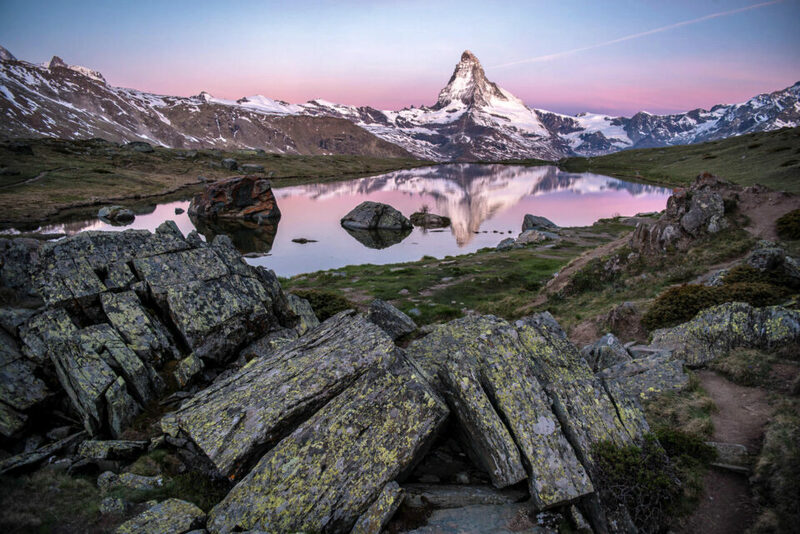 V.
Dear Václav, congrats for the terrific pics taken and thanks a lot for your impressions and tips towards Zermatt/ Matterhorn. I am collecting all the data available, as in mid November ( I know that it might not be the best season) I shall leave Keykjavik and fly to Zurich and afterwards arrive in Zermatt. PS. I tried to follow you in Instagram but a supposed account I found is empty. I did try to visit your page, but unfortunately I cannot read Czech at all..(Laughing). Hi Václav, very nice pictures, and very detailled article, good job ! Could you please tell me, what month do you take the pictures ? Thanks for your advise about this ! Hi Bruno, I was there at around June 15, some lifts did not operate fully yet. 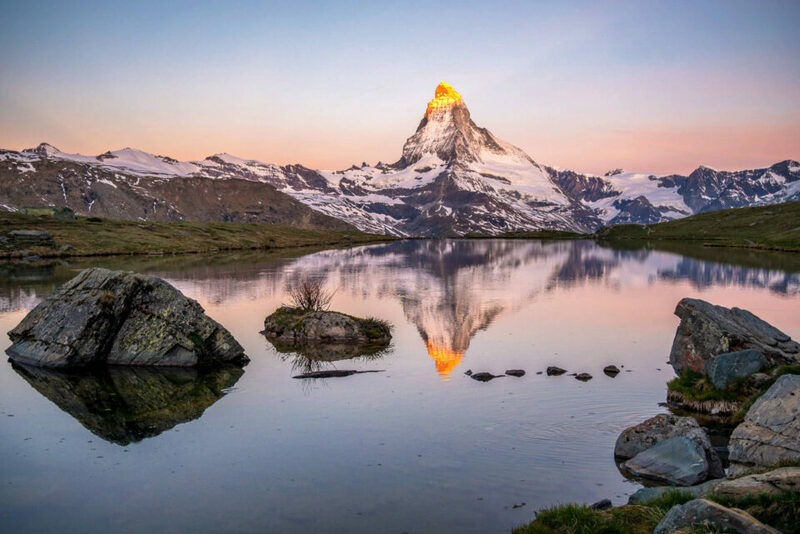 I would not be too concerned that Matterhorn will lose all the snow cover in the summer – given the height and given the orientation of the summit (facing slightly towards the north), my bet is that August will work great for you (if you catch some good light there). Good luck with your trip! Fabulous photos and priceless information. My husband and I will be in Zermatt for three days in mid July then on to Wengen for 3 days. I have a Nikon D5300 that I have used to shoot many Milky Way photos. I am hoping to get a the Milky Way and Matterhorn shot on this trip. I plan to follow your advice of taking the last train up and hiking down after getting my shot. Fingers crossed that the skies are clear. Thank you for your wonderful article! Oh thanks, your feedback is a very good motivation for me to keep writing such posts! Thank you so much for sharing all this precious information! I will go to Switzerland for work at the end of October 2018 and will have one free day to take advantage of for photography. This will be very helpful to try to catch something at sunrise and sunset that at Stellisee. The Sunnegga-bahn funicular + ski lift to the Unterrothorn station tip and knowing that it’s safe to walk back during blue hour with a headlight is a gem and exactly what I was looking for. These tips just aren’t out there on the internet. You are welcome, enjoy your trip! V.
Lovely shots! I’m going back after a 40 year “break.” Looking forward to showing my partner one of my favorite places. Especially at Christmas time. Singing X-Mas carols in the English Chapel on X-Mas Eve is really special! Fortunately I’m retired now and can afford a few days there. Most of the rest of the time we will be spending with friends who live in Zurich and Klosters, and then outside of Munich. Funny that there is seemingly no mention of Infrared in his photo descriptions? I’m planning on taking a converted IR camera … 850 filter … for max contrast. There doesn’t seem to be very many IR Alp photos around? Enjoy the trip! Zermatt is indeed very expensive, but I am sure you will find plenty of interesting motifs and subjects around Munich too.